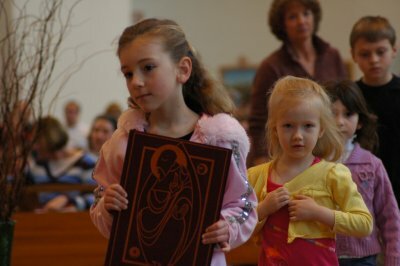 At St. Clement we invite all children to join us during the 10:30am Sunday Mass for the Childrens' Liturgy of the Word. After the opening prayer of the Mass, the children who wish to participate are called forward, receive a special blessing, and are sent forth with their leaders to hear and break open the scriptures of the day in a way they can understand, learn from and hopefully apply to their lives. The children return to celebrate the Liturgy of the Eucharist and re-enter the assembly as part of the Offertory Procession. In 1973, the Congregation for Divine Worship in Rome issued the document Directory for Masses with Children. it will be appropriate to celebrate the liturgy of the word, including a homily, with the children in a separate, but not too distant, room. Then, before the eucharistic liturgy begins, the children are led to the place where the adults have meanwhile celebrated their own liturgy of the word (DMC #17). 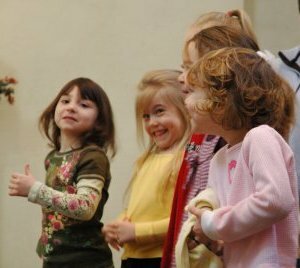 Children’s Liturgy of the Word is first and foremost a worship experience. Children’s Liturgy of the Word is a special celebration which enables the young people of our parish to hear and celebrate the Word of God on Sundays in a setting adapted to their needs and capabilities. Children have the right to hear what God has to say to them. They have the right because they have been baptized. God wants to speak to children as well as to adults. The problem is that in our liturgy, scripture is proclaimed in adult language which the children may not comprehend. This celebration with children will enable them to discover and recognize themselves in the story proclaimed in the Gospels. When they make the discovery from within their experience, they can then thank, and praise, and bless God in their daily lives. 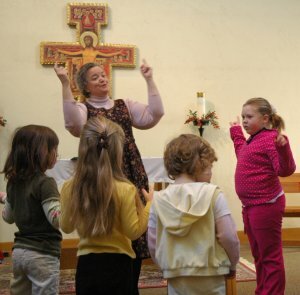 celebrations of these liturgies are intended to form children in the liturgical language of the church, to nourish and guide their spiritual growth, and to immerse them in the Word in ways that are understandable to them.